As we all know, EVE is a competitive PvP sandbox game, one that gives an immense amount of freedom to its players. It's true that EVE players need to follow certain rules, such as those found within the EULA/ToS, the Code, etc. Generally speaking, however, players have a lot of freedom. 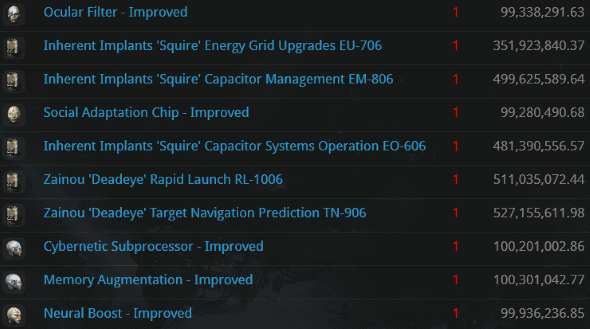 With each new element CCP introduces into the game, there are more opportunities for EVE players to do something smart or something foolish. Let's consider some of the losses suffered by foolish players during the week of May 15th @ 00:00 EVEtime through May 21st @ 23:59 EVEtime. 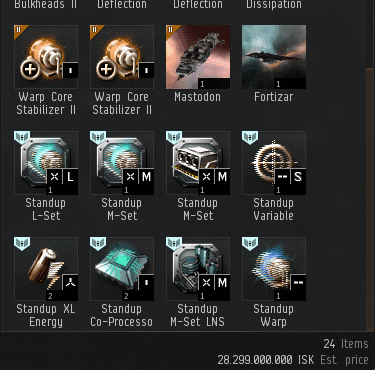 Tolean Sauren was really excited about moving his 5 billion isk cargo. His Badger wasn't particularly well tanked, but it was armed with weapons, so it's not like it was a ship that couldn't shoot back. Our Agents love a challenge, so the Badger became a big target. Agents Rick Therapist, Brutal Anna, and Carebears' Nightmare took down the Badger with a well-executed ambush. 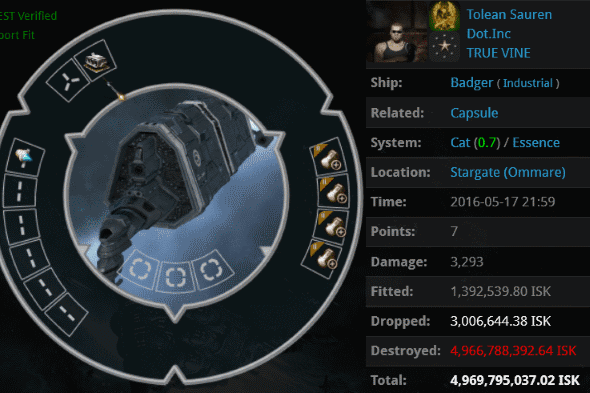 Most of the cargo's value was from a pair of titan skins. Welcome to New Order space, nullsec dweller! 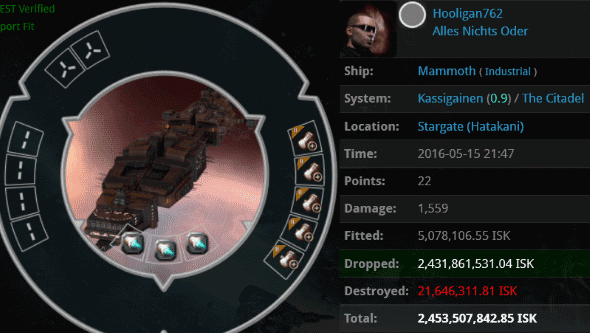 CCP made skins for players to enjoy, and the carebears naturally found a way to lose lots of money on them. To an old-school player like myself, gas mining is a relatively new concept. princess moonclover took great care in designing her gas-mining ship. She took a hictor and nonuple-anti-tanked it. Not to worry, though, because she also fit a sturdy capacitor tank. Agent Lucia somehow managed to penetrate the miner's defenses. What a mystery. I'm not particularly fond of mining frigates. The Venture was designed by CCP for use in low/null/wormholes, but carebears claimed it for themselves as a "highsec newbie" mining ship. So CCP, hoping the carebears would finally get the point, created a covert ops mining frigate called the Endurance. Unsurprisingly, carebears like Poseidon 1 use it for highsec mining, too. And they add bling. An 888 million isk mining frigate was too good for Agent Gatosai to pass up. 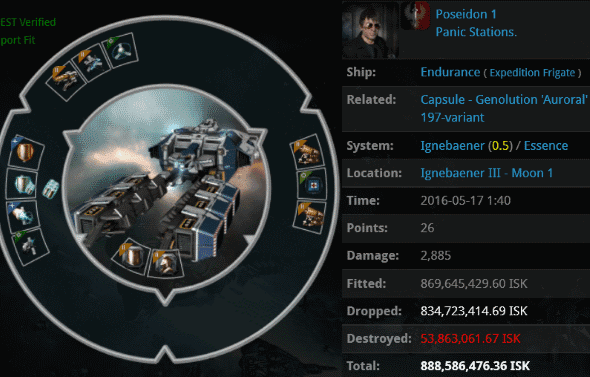 He popped it, along with Poseidon's 1.8 billion isk pod. Gatosai destroyed the 3.8 billion isk Navy Dominix, which of course had plenty of weapons. But Gatosai also kept his promise to wait. About four years later, Gatosai ran into Poseidon, who was now in a corp that Gatosai's had wardecced. Hence the Endurance killmail. Having learned nothing, Poseidon retrieved his favorite ship, a Navy Dominix, and came back to fight. 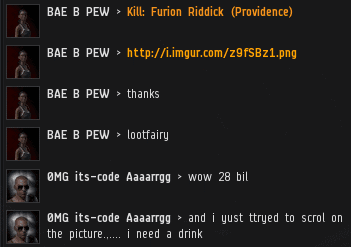 The result was a 2.5 billion isk killmail. Furion Riddick had a 32.5 billion isk freighter and wasted no time in suicidally charging into the Uedama corridor. He was met by Agents dude there's my-pod, Logical Fallacy, Krisi Kristo, Yvain Bluewater, Nin Rin, Bratok Srayona, Victoria Valentines, Yojiro, Danyael Tyren, Pivke Anneto, Prixm Wind, Synamic, Miner Compliance Officer, Heck Heckington, Krakisht, Ido Adudu, BAE B PEW, Dea Tacita Larunda, Hayley, Multiple Inbound Supercaps, BAE B BLUE, Logical Fatality, Unwarranted Assumption, Etrisa, Gea Stormbound, Mike Hunte, and Breakfast Lord. They gave him the customary Uedama greeting. Anti-Ganking failed to prevent our heroes from recovering the 28.3 billion isk loot drop from the freighter. The loot contained a Fortizar, which is either some new Citadel thing or a Pokémon. 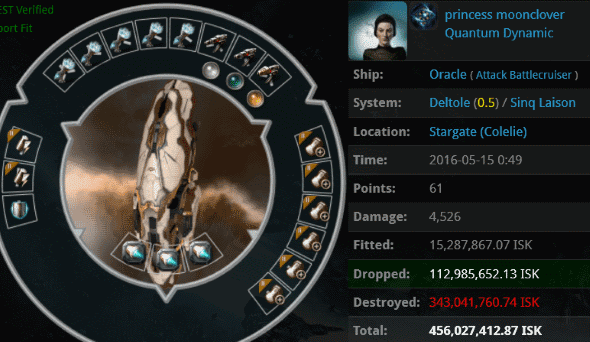 Regardless, CCP created it and carebears lose more stuff because of it. A carebear's loss is our gain. Knowing that highsec isn't 100% safe, Hooligan762 took the cautious approach and hauled his 2.4 billion isk cargo with an octuple-anti-tanked industrial. With any luck, gankers wouldn't be able to pierce his 1,559-hitpoint ship. But fortune favors the Code. Agent Votre Dieu blapped the Mammoth and enjoyed his new killmail. Not a week goes by without someone transporting Skill Injectors in a manner unworthy of the new highsec. In addition to industrials, shuttles are frequently abused. This week saw the destruction of a 1.2 billion isk shuttle, a 2.1 billion isk shuttle, and a 2.4 billion isk shuttle. Madness! 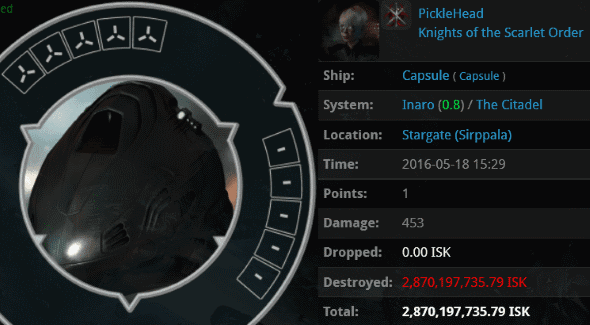 PickleHead's head was 2.8 billion isk lighter when he encountered a true Knight from the true Order. Agent zykerx lived up to the reputation of Vrix Nation and popped PickleHead's autopiloting pod. Judging by the implants, PickleHead intended to fly a ship that could shoot back. Alas, he took a ride on the pod express instead. Wrong, there are plenty of words to share with the grandchildren!! Otherwise, staggering collection of fail. Why do they do it? Yes, go back to WoW. Help Wolf with his quest to bring justice to the unjust!! Wolf terrifies you doesn't he...?! 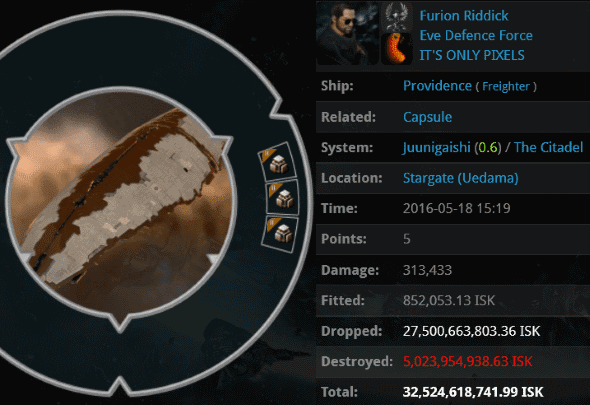 "The loot contained a Fortizar, which is either some new Citadel thing or a Pokémon." CODE must deploy this Fortizar in Uedama. And then we can see if AG can take it down. That's the sound of silence from AG and all the whiney crybabies about their failures to stop the elite pvp taking place in James 315 Sov space. I doubt "AG" is there to save anyone any more than the code is. Losing weight through extreme exercising and dieting may backfire on you and instead make weight loss even harder than when you started. Instead, learning to incorporate gradual, long-term changes that fit with your lifestyle may be the key to your success. Who, oh who is Ming?! Furion Riddick started the self-destruct on his ship when we arrived. We were glad to assist. Its own like you analyze my mind! You seem to recognize a huge amount concerning this, like you developed quick guide in this or something. I mean that you favor a number of pictures to have the message house a little of, no matter besides that, this is fantastic blog post website. An outstanding read. I'll absolutely be back. Wonderful! This weblog web site looks especially like my aged one! That's on a totally other topic however this has almost the specific same web site layout along with design. Impressive alternative of shades!